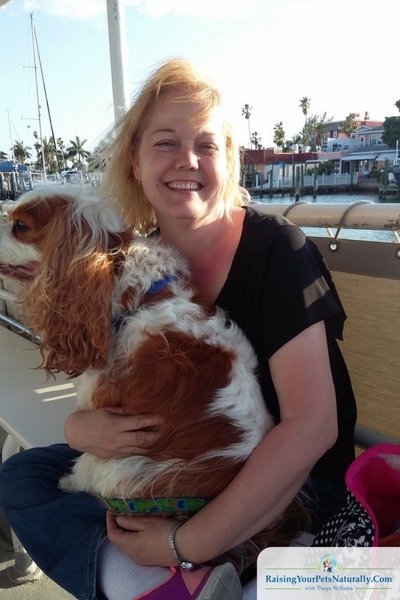 During our dog-friendly Florida vacation, we had to do a dog-friendly sunset cruise! I mean, Dexter is a total boat dog. He loves everything about boat rides. 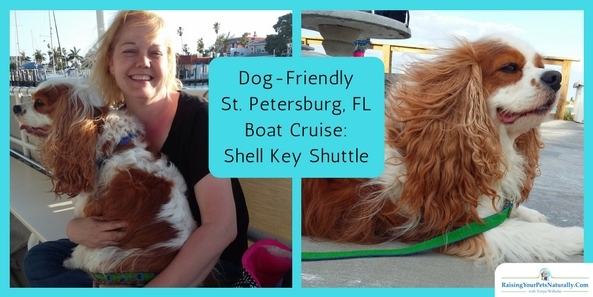 Before our trip, I saw that Shell Key Shuttle had a page on their website stating the sunset cruise was dog-friendly. 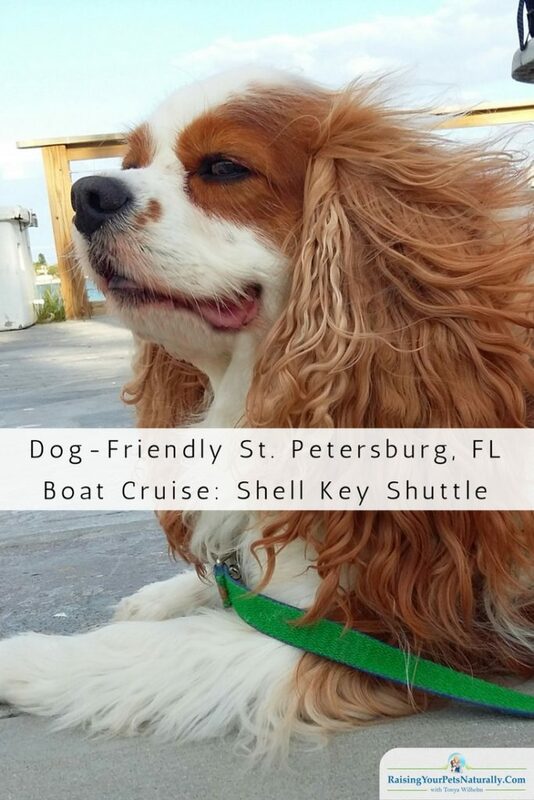 I always like to confirm and check the rules, so I contacted Shell Key Shuttle and they quickly responded to my email explaining that their day trips to Shell Key were not dog-friendly because of the Audubon preserve, but they did allow dogs on their sunset/dolphin watching cruises. That was awesome news. We called in our reservation the day of the cruise and arrived at the Merry Pier (801 Pass-A-Grille Way) half an hour before departure. When Dexter saw the dock and boat, he was very happy. I think this boy is a mind-reader and knew we were going for a pet-friendly boat ride. We checked in, then were helped aboard the shuttle. I brought water, dog treats, a dog mat, my camera and of, course Dexter. We were ready to check out some Florida dolphins, then head into the sunset. This Florida dolphin cruise was very enjoyable, and the captain and crew were welcoming and friendly. We started with a great sight-seeing cruise through residential waterways and through the inspiring barrier islands south of Pass-a-Grille. We went from historic cypress beach cabins to modern multi-million dollar mansions. The captain even stopped and pointed out numerous shorebirds. And yes, we saw dolphins! It was so much fun to see them leaping and swimming all around. Dexter was oblivious, as he just sat back and soaked up the salt air. I think having the breeze blow through his ears and nose is heaven for him. After our residential tour, we headed toward the sunset. Wow. It was amazing. By the end of our 1.5-hour dog-friendly sunset cruise, Dexter was asleep. I’m sure it had to do with having such an action-packed day, the ocean breeze, and smooth rock of the boat. If you find yourself in St. Petersburg, Florida, I encourage you to take your dog and the family on a sunset/dolphin cruise aboard The Shell Key Shuttle. You won’t be disappointed. Have you taken your dog or cat on a pet-friendly boat ride or cruise? Tell me in the comments. That looks like a great day and so well behaved. Such a cute dog. Thank you. Yes, Dexter is a pretty good boy. Fantastic day! That is so sweet. I love him and what I do. Your dog is so cuteeee! This sounds like a fun day & your dog is so cute! Thanks! It was such a great day. I wish every day could end with a sunset cruise. Thank you. Yes, he is so happy. Make my heart feel good. Oh my gosh, what a fun thing to do with your pup, who is totally adorable by the way! Thanks! Dexter loves his adventures and LOVES boat rides. You and Dexter both look so happy on the high seas!! The only boat Red and Jack have been on is a 3 minute ferry ride that connects our city to another larger one, and is faster than driving. Being as easy going as Red is, she doesn’t mind it at all, but Jack is not thrilled. He won’t walk down the ramp because he doesn’t like the texture of it, and seems nervous on the ride itself. I can’t see going on a cruise as I have a bit of control freakiness about me and the need to be able to leave when I want to, so Jack’s dislike of boats probably isn’t going to be a problem. Thanks. haha It’s always a challenge when we aren’t in control. I also get seasick, so I took my ginger candy. Luckily, it wasn’t an issue for me. Thanks, Alli. 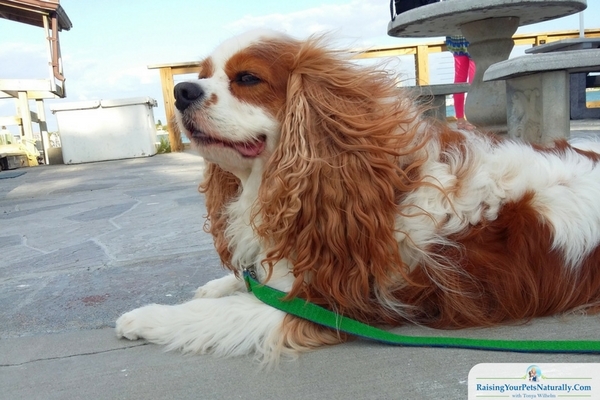 Yes, the Cavalier is a great family dog. And Dexter has a very adventurous spirit. I love St. Peterson but haven’t tried the sunset cruise yet. Will have to do this. If in Ft. Lauderdale there are a couple of water tours that allow your dogs. Mine love the water, the challenge, convining them it isn’t a anchor and swim trip. Haha You are very lucky to be on the coast. Dexter loves his boat rides and to dip his toes in the ocean. But, swimming, he passes on that one. You guys find so much fun stuff to do! Penny would absolutely love a dog friendly boat ride! They allow dogs on some whale tours here, I think. I want to take Mr. N sometime. Dolphins would be amazing too! A whale tour would be really neat! You are making a case for us to head West! How fun! Our current dog, Ruby, doesn’t like water much. We are trying to get her used to it. Our previous dog LOVED water and he joined us on lots of boat trips – both informal boat and canoe rides, but also a cruise on the Chicago River near where we live. Hopefully, Ruby will eventually like it, too. Dexter doesn’t love being in the water, just on the water. haha We also took a Chicago boat ride! I think Magic would want to BARK at the “big fish” and it’s likely that Karma would want to go fishing. The pictures look fabulous! Someday I’ll get a vacation again. *sigh* Working working working…. What a small world. We will be purchasing a pontoon boat and a smaller fishing boat in 13 months. Dexter will be in heaven. Yes, he’s pretty chill on his rides. We will be getting a pontoon boat in 13 months. We can’t wait! Yes, we tend to take these adventures in the spring before it gets too hot. The boat cruise sounds fun! I love being out on the water and taking the dogs along would be awesome! Water is so amazing. It was so nice to be able to take Dexter on this boat trip. He loves boats! Looks like you and Dexter had a great time. Great pics too! Now off to the next adventure! For sure! We are less than 30 days away from another beach trip! Thank you. Yes, when they are the only dogs, they sure do get lots of attention. Especially when they are good like Layla and Dexter! Happy Easter and Passover. I grew up in FL. St Pete is one of my favorite places. I’ve not taken the Poodle Pair on a boat, but think they would enjoy it. I’ve been thinking about visiting St. Pete a lot lately, need to pick dates and get it booked! Looks like Dexter had a good time on the cruise. Wow. It’s so fun hearing that people actually live or visited some of our vacation spots. Yes, we had such a great time. We will be back in 13 months! I never realized how many dog friendly activities there are to do in the U.S. I think it’s great that people can bring their dogs with them when they go away. I miss my cats terribly when I’m away and worry about them. It’s so hard leaving our pets behind. I do leave my cat with a pet sitter when we travel. He’s not a traveling cat, so I’m sure he’s much happier. But I do miss him! This looks like a lovely trip. I love boat trips, the breeze, the water and the excitement! We did a trip in Auckland across to Devonport, not long but it’s fun seeing the land disappear and reappear! I love that photo of Dex with the breeze blowing in his hair! I haven’t taken my dogs on a cruise, but our Maltese loves being in a canoe. Sophie is iffy and we haven’t tried Theo. He is happy on a floatie on the pool, so I think he would enjoy any type of boat as well. Harley and Shasta both love boats. Harley even used to bark as he watched the boat being loaded up to make sure we didn’t leave him behind. Sounds like you all had a fun boat ride! That’s so cute! I love that Harley wants to be part of the adventure. Thanks for sharing. That sounds like so much fun! It is obvious that Dexter is enjoying himself. It’s always nice to find pet-friendly activities while on vacation. I’ve been making a list of them for our upcoming trip to Charleston! Can’t wait! Dexter just loves life! We visited Charleston, SC too. A great city. We want to go back for a bit more time. Getting my dogs out on a boat is at the top of my bucket list for them. You’re so lucky Dexter is such a boat ride lover! I hope I can get my dogs to love being out on the water too, it’s something I enjoy so much and would love to have them with me. Thanks. If there is water, check around. It seems every city that has a nice body of water and offers boat rides, we’ve been able to find one that allows dogs! Yay for seeing dolphins! So cool! We have never had a chance to bring the pups on a boat up to this point, but I’m hoping to go kayaking with them this summer. Thanks for sharing all of these awesome dog friendly options when folks are visiting Florida! 🙂 Dexter’s enjoying life expression. Yes, it would be a bit much for a newly traveled cat. However, lots of birds to watch! Do you put a life jacket on Dexter when he’s on a boat? I had friends who lived on the lake and their dogs loved the water, but they always wore the life vests on the boat. Glad you had a great time. Great post! dog, a man’s bestfriend, a friend can let you down but dog aren’t, they still hug you after leaving them for a day!